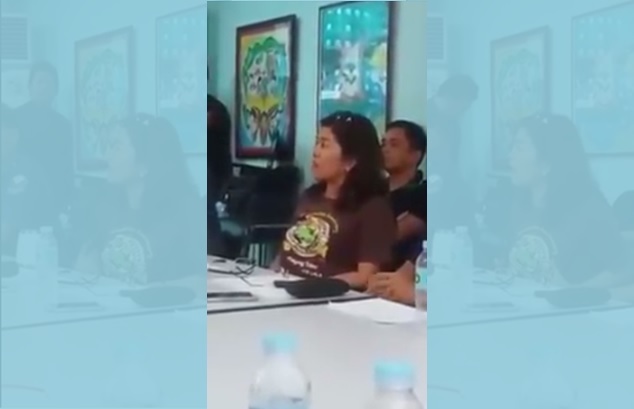 MANILA, Philippines- A video of North Cotabato governor Emmylou "Lala" Taliño Mendoza warning politicians planning to donate rice to drought-hit Kidapawan City farmers is making rounds on social media. Mendoza also cautioned politicians not to use North Cotabato as their staging ground for propaganda in order to get support from the international community and collect money. According to reports, Mendoza was pertaining to the camp of presidential aspirant and Davao City Mayor Rodrigo “Digong” Duterte who have gathered 30 sacks of rice for the hungry farmers of Kidapawan City. However, Duterte Presidential Campaign Team head Peter Laviña clarified that Duterte advised them not to meddle with the ongoing problem in Cotabato. He also alleged Mendoza of not performing her duties. "We do not have intentions to interfere with the trouble there but there is a problem, people are getting harassed so we have to help,” Laviña said. About 5,000 farmers coming from different parts of North Cotabato province held a protest on Wednesday, March 30 to demand government assistance after their farms were hit by the El Niño. Portions of the Cotabato-Davao Highway were blocked during the protest. But instead of getting calamity fund and rice provision, the protest turned into a violent dispersal between policemen and the farmers. The clash resulted into the death of three protesters while 116 others were injured. A farmer reportedly died on the spot during the encounter. According to Apo Sandawa Lumadnong Panaghiusa sa Cotabato leader Norma Capuyan, the police, who were trying to protect the National Food Authority provincial office from the protesters, were trying to disperse them using water cannons. However, when the farmers stood their ground, the police began firing. In an interview with ANC, Mendoza insisted that the police officers had exercised maximum tolerance during the protests.